TALLAHASSEE – Gov. Rick Scott and the Cabinet have signed the Gold Star Family Day in Florida Resolution, recognizing the heartfelt sacrifices Gold Star Family members have experienced through the years. The resolution calls upon local government officials to display the United States Flag on government buildings, and urges Floridians to display the flag and to hold appropriate meetings in their homes, places of worship, or other suitable places, as public expression of the sympathy and respect that our State holds for its Gold Star Families. 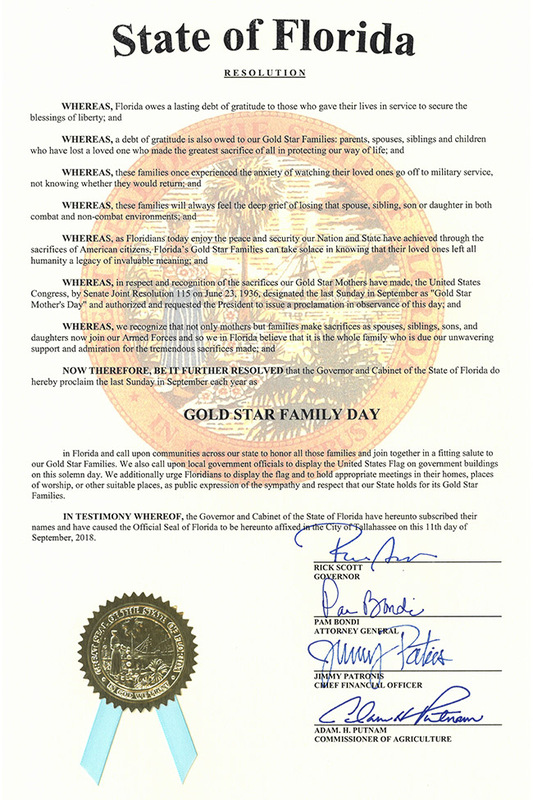 Sept. 30 is Gold Star Family Day in Florida.